We set off in very good spirits on Sunday morning, excitement about getting home later in the day obviously mixed with the familiar excitement that we all get on match day anyway. After a while walking on the Trans Penine Trail we could see the Humber Bridge in the distance, seeing our first glimpse of home seemed to increase our pace despite our inevitable tiredness. This time we were accompanied by sheep on the trail and, although there wasn’t as much as the previous day with the cows, there was still a significant amount of the smelly stuff for us to dodge round while keeping up our tremendous pace. Finally we reached Brough and were only too happy to leave the trail behind for a while and walk on a harder surface which made the walking so much easier. Thankfully during the early morning the weather was a little bit cooler than it had been the day before but it didn’t last terribly long and we were soon taking fluids on board to cool down. 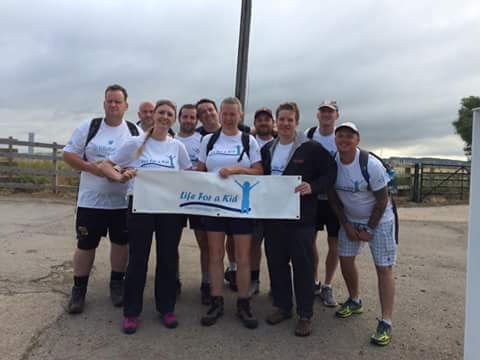 We kept walking at a very good pace and we were soon through Melton and then most of the team decided they needed to check the plumbing at a garage so we were delayed for about half an hour because said garage only had 1 toilet so they all had to take it in turns. We went through North Ferriby, which needs saving, at a good rate of knots and Alison’s sister met us and brought supplies of Haribo Starmix and bottles of water which were soon, very gratefully, snapped up. We reached Home Farm at Hessle much earlier than had been anticipated so this gave us time to have a very nice and very welcome long break to go to the toilet and have food and drink. Whilst we were there Darren and Jodee turned up in the minibus and said we needed to not walk so fast because they were falling behind because of a problem with packing away one of the tents. Being only 5 miles from where we needed to be we were in the mood to take it a little bit easier but we also wanted to finish quite soon and have plenty of time to recover before the match. Having stopped at The Fiveways pub we then started again and next stopped at The Three Tuns on Boothferry Road and received some donations in the buckets that were being carried. 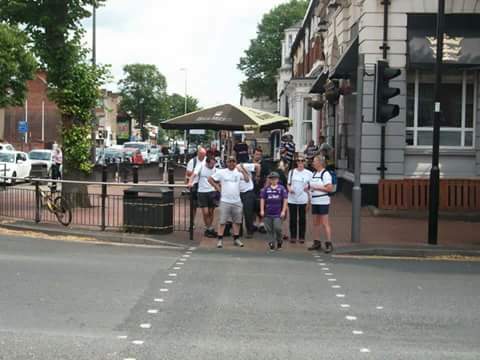 As our bucket collection carried on to Silver Cod, The Three Crowns and the Albert Hotel we were chased down Anlaby Road by two Castleford fans so they could put money in the bucket for us, showing the true colours of all genuine rugby league fans as they did so. Eventually I had to leave my fellow walkers in the Albert Hotel and head to the media suite at the KC Stadium to get logged on the WiFi ready to write my match report. As I had promised I met the rest of them for a photo opportunity outside the main reception at the stadium as we finally basked in the glow of the summer sunshine and our achievement. The fun and games didn’t finish there for us though, I made my way painfully to the press box at the very top of the West Stand and started reporting on the Super League game Hull FC v Castleford Tigers but had to be down at the North West corner of the stadium just before half time. In that corner I saw Tom Lineham denied what looked like a legitimate try and the lads trudged off trailing 6-14 at half time, then came our moment as we were introduced to the crowd and the picture of us outside Castleford Tigers home ground the day before was flashed up on the scoreboard as we started our lap of honour. 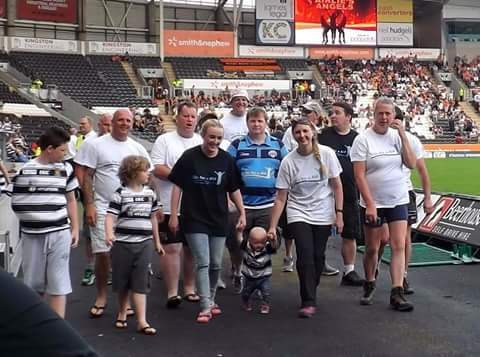 As we walked around the stadium we had Hull FC and Castleford Tigers fans applauding us, shaking our hands and hugging us and even giving us a standing ovation showing us how much this remarkable band of people had achieved since the day before, making the hair on the back of my neck stand on end. To complete a perfect day my beloved Hull FC came back and secured a stunning 21-18 victory in quite dramatic style. I’m never going to forget this challenge and, indeed, look forward to doing it all over again hopefully next year. The friendships that have been built during this weekend will, I’m sure, last for a lifetime. I am proud to say I did this and even prouder to say that everybody involved in this genuine adventure are all very good friends, the once in a lifetime kind of people.